Life is short. So are films. 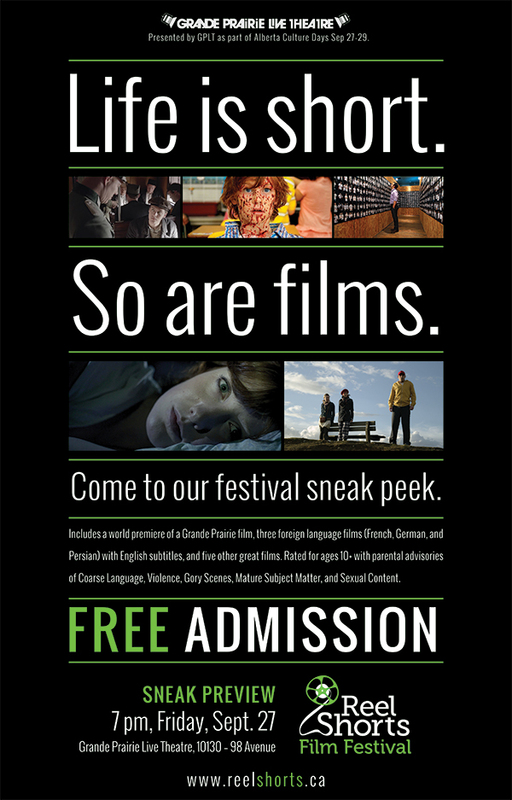 See nine of the films that will be in our 2014 fest. Celebrate the world premiere of a Grande Prairie film while exploring the globe with cinematic delights from Canada, the US, Europe, and Iran. Enjoy a favorite genre from this wonderfully diverse package that includes a documentary, dramas, and comedies. With a rating of 10+ and parental advisories of Coarse Language, Gory Scenes, Mature Subject Matter, and Sexual Content, this package is not recommended for young children. The two foreign-language films (French and Persian) have English subtitles. There will be an intermission during the package and a Q&A with The Visitor Director Devon Burbank following it. Audience members are welcome to attend the after-party upstairs in Encores. Details of the package can be found here. Trailers as well as the poster designed by the wonderfully talented Chris Beauchamp can be found below. Hope to see you at the Sneak Preview!